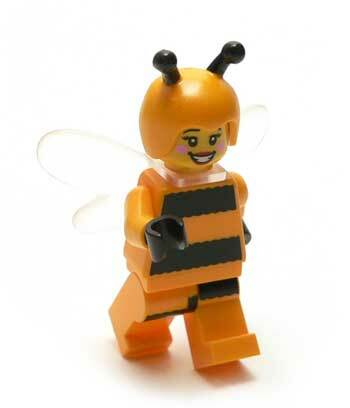 Lego has served up some great minifigures again in Series 10 of their blind bags. I really don’t have hope of finding a Mister Gold, but that really doesn’t bother me. I was in the store feeling through a bunch of bags looking for Medusa’s tail and was striking out. However, I did feel something in one of the bags I couldn’t identify. It felt like a mermaid tail, but I didn’t think there was a mermaid in the series. Turns out is was Bumblebee Girl’s wings! 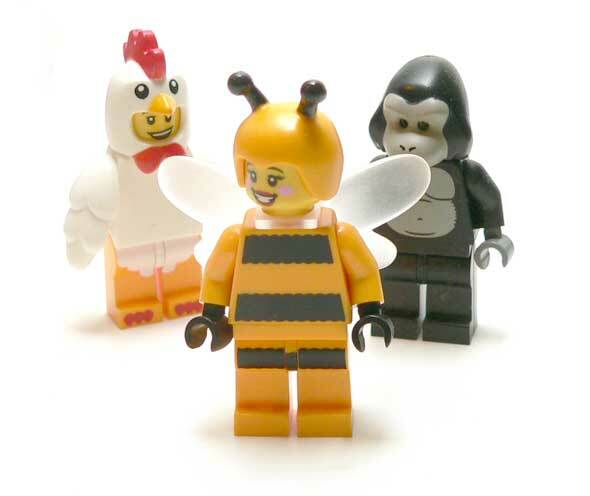 Bumblebee girl continues the tradition of humans in animal suits like the Gorilla Suit Guy and Chicken Suit Guy. It’s kind of neat they went with a girl this time. A Queen Bee, if you will. The body here is standard and actually plainly painted. There are just some stripes of black. One of them is actually on the legs, which is kind of cool. The stripes have irregular edges to give that furry body look. The really place this figure your shines is in the accessories. The head piece is a rubber piece as opposes to the hard plastic normally used for hair pieces. Here it is more of a helmet with antennae than hair. It does a nice job of framing the details on her face. Of course the wings are a big part of getting this character’s look. They are made from frosted translucent plastic. I wasn’t sure how they were going to attach, but there’s a tab that goes over the neck and is held in place by the head. They are pretty clever. 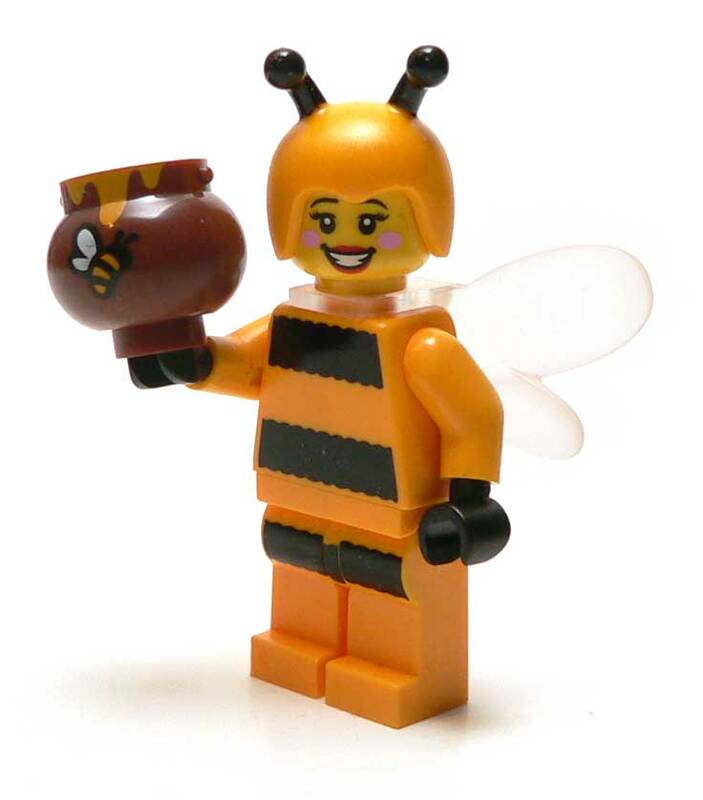 Of course every bee needs honey. This girl has a small pot with painted details of honey and a bee on it. I’m sure this was a Harry Potter cauldron at one time, but it works perfectly well here. It always amazes me how well Lego pulls off these minifigures. Their designs are simple but they are executed so darn flawlessly. 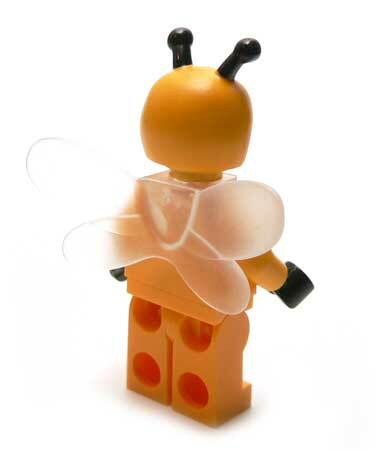 For a figure I wanted but wasn’t expecting to easily find, I’m sure glad to add this bee to my hive of Lego figures. Now I can stop motion animate that Blind Mellon video…. She has a great smile and I like very much the blush on her cheeks.